There was a reason the Cleveland Cavaliers hung on to most of their veteran players this offseason, even after the departure of LeBron James. Part of this was based on the front office fooling itself into thinking this team could still make the playoffs without the greatest player on the planet. Cleveland also wanted to ensure the younger players it’d be relying on this year would have strong veteran leadership to lean on. Barely a month into the season, none of this has come into fruition. As a result, there’s really no reason for any of the Cavs’ experienced players to be involved anymore. Sure, Cleveland will obviously need a few of these guys, if only to field a full team on game nights. However, look at some of the vets in question and ask yourself what purpose they serve for the season ahead, keeping in mind the fact this is now a full-fledged rebuild. Kyle Korver has clearly earned the right play for a contender, and was at one point completely pulled from the rotation. On top of this, when the Cavs re-signed him in 2017, it came with reassurances that they’d trade him in the event James fled in free agency. As a result, he’s probably just as confused as we are when it comes to why he’s still in Cleveland. J.R. Smith looks miserable, and has already implied he’d like to be traded. Both he and Kevin Love have expressed frustration about being told by the front office there’d be no tanking this year. Speaking of which, Love has been airing his grievances as of late, while also recovering from toe surgery which has him sidelined for almost two months. The team would be wise to work the phones in attempt to deal him, as he’d likely net the most returns. Channing Frye was re-signed this summer, as well. He’s touched the court one time in ten games, despite the fact Love is sidelined. 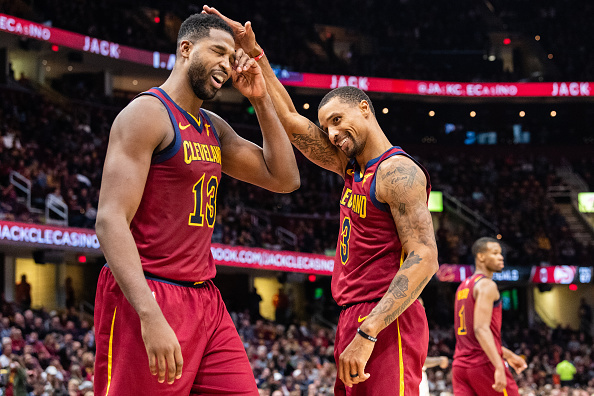 Some players, like Tristan Thompson and George Hill, have had their moments. However, it’s doubtful either would turn down an opportunity to play elsewhere, though Thompson is still talking as if this team just has to iron a few things out before turning the season around. As you can see, the Cavs no longer playing meaningful basketball this year has rendered most of these players useless. You could make the argument that, if the team was always this close to admitting the postseason was a pipe dream, the vets never served a purpose to begin with. That said, a counter would be noting how valuable it is to have veteran leadership for younger players. However, even this appears to be something the Cavs aren’t getting. This past weekend, we heard that older players in Cleveland’s locker room are already upset with rookie point guard Collin Sexton, anonymously insisting he doesn’t know how to play properly. They’re apparently frustrated by his struggles at playing defense and inability to set other players up on offense. While Hill reportedly claimed he’d teach Sexton how to play defense, there’s concern regarding whether he’ll listen. To be fair, no, Sexton’s rookie year hasn’t gotten off to a good start, as he’s been underwhelming more often than not this season. At the same time, he’s 19-years-old. He had one year of college experience. To say the learning curve was steep from the get-go is an understatement. With that said, what is he supposed to learn from hearing teammates anonymously take swipes at him through the media? What are we supposed to think about the leadership in the locker room if it took just nine games for vets to resort to dumping on a 19-year-old? It’s admittedly concerning to hear Sexton might not be receptive to lessons he’s being taught. Still, how is he supposed to react to this? Is hearing your teammates bash you through beat writers – and do so without putting their names behind the comments – supposed to inspire you to listen to them? Essentially, the veterans Cleveland retained this offseason aren’t going to help towards any ill-fated playoff push, and seem incredibly quick to give up on one of the team’s key players for the future. They’re acting out of grumpiness, upset the youth on the roster isn’t accepting the lessons of players who, for the most part, rode James’ coattails for the past four years. As a result, the team’s primary focus with these vets is finding them a new roster to join. It’s difficult to determine just what exactly they’re supposed to contribute for this team moving forward.